(Nanowerk News) Researchers at the University of Illinois at Urbana-Champaign have developed a unique single-step process to achieve three-dimensional (3D) texturing of graphene and graphite. Using a commercially available thermally activated shape-memory polymer substrate, this 3D texturing, or "crumpling," allows for increased surface area and opens the doors to expanded capabilities for electronics and biomaterials. "Fundamentally, intrinsic strains on crumpled graphene could allow modulation of electrical and optical properties of graphene," explained SungWoo Nam, an assistant professor of mechanical science and engineering at Illinois. "We believe that the crumpled graphene surfaces can be used as higher surface area electrodes for battery and supercapacitor applications. As a coating layer, 3D textured/crumpled nano-topographies could allow omniphobic/anti-bacterial surfaces for advanced coating applications." Graphene--a single atomic layer of sp2-bonded carbon atoms--has been a material of intensive research and interest over recent years. A combination of exceptional mechanical properties, high carrier mobility, thermal conductivity, and chemical inertness, make graphene a prime candidate material for next generation optoelectronic, electromechanical, and biomedical applications. 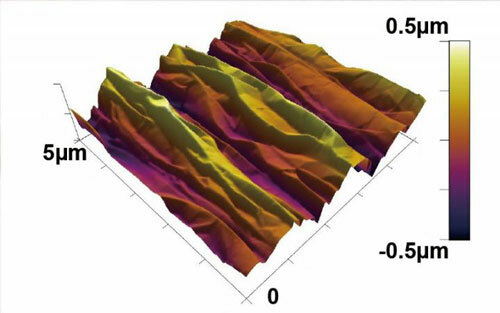 "In this study, we developed a novel method for controlled crumpling of graphene and graphite via heat-induced contractile deformation of the underlying substrate," explained Michael Cai Wang, a graduate student and first author of the paper, ("Heterogeneous, Three-Dimensional Texturing of Graphene", which appeared in the journal Nano Letters. "While graphene intrinsically exhibits tiny ripples in ambient conditions, we created large and tunable crumpled textures in a tailored and scalable fashion." "As a simpler, more scalable, and spatially selective method, this texturing of graphene and graphite exploits the thermally induced transformation of shape-memory thermoplastics, which has been previously applied to microfluidic device fabrication, metallic film patterning, nanowire assembly, and robotic self-assembly applications," added Nam, whose group has filed a patent for their novel strategy. "The thermoplastic nature of the polymeric substrate also allows for the crumpled graphene morphology to be arbitrarily re-flattened at the same elevated temperature for the crumpling process." "Due to the extremely low cost and ease of processing of our approach, we believe that this will be a new way to manufacture nanoscale topographies for graphene and many other 2D and thin-film materials." "Enhanced surface area will allow even more sensitive and intimate interactions with biological systems, leading to high sensitivity devices," Nam said.